My wife and I picked the perfect weekend to escape the city and spend some time in the country. Here in Northern Wisconsin, we are treated to a beautiful show of colors as the trees put on their annual fall foliage show. Although the view is amazing driving down winding country roads, I know one place that offers an even better vantage point. So, I drove over to Cherryland Airport for some time in their Cessna 172. I flew north from Sturgeon Bay flying along the bay side of the peninsula as it narrows. 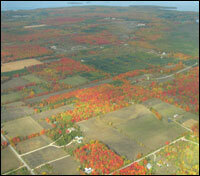 Along the way I had a spectacular aerial view of the vast array of colors on the forests below. Close to the northern tip of the peninsula is one of my favorite airports, the quaint Ephraim-Gibraltar Airport. It is a small two-runway airport nestled in the woods on a ridge just south and east of the town of Ephraim. After overflying the field to check the windsock that sat mostly limp I selected runway 32 which at 2,700 x 60 feet is the larger of the two runways and the only paved runway at Ephraim. I made a nice smooth landing then rolled off slowly to the end of the runway straight onto the grass. I wanted to taxi down the turf runway to ensure it was in safe enough condition to use for landings and takeoffs. Sure enough, the turf runway was in great shape with only a few minor bumps. I followed turf procedures and turned the airplane around at the end but kept them plane rolling. I tossed in 10° of flaps and kept pulling back on the yoke to lighten the pressure on the nose wheel. Out the cockpit window was a sight every pilot must love, a well maintained turf runway with some distant trees glowing in a mixture of yellow, orange and red leaves signaling the end of the runway. As the airspeed increased I lifted the plane into ground effect just feet off the ground and let the speed continue to pick-up before pulling further back on the yoke and climbing safely over the trees and then out over the bay. On departure I noticed a Maule in the vicinity so I flew a wider pattern to ensure we had plenty of separation. As I turned on final I picked a spot to aim for and focused on bringing the plane in nice and slow for a soft turf landing. I flared a few feet above the ground and listened to the stall horn sound then moments later the main gear settled softly onto the turf. I continued to apply back pressure until finally the front wheel also touched down. This was by far my favorite landing of the year. After that I flew back to Sturgeon Bay. On the return flight I pulled out the camera to snap a few photos. Unfortunately, the photos don't do justice to Mother Nature's show. I brought along my GPS Data Logger on this flight. Thanks to some advice from Peter and from Jayson I was able to successfully track the flight and then overlay that track on a Google Map. I was pleasantly surprised at how easy the device was to use. 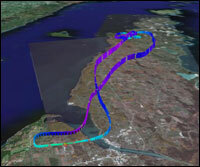 You can click on the photo of the track to see a larger scale version of the flight track. You can be sure that I will be bringing the GPS Data Logger along for future flights. Those turf or soft field landings are so much fun! Lucky you! :) Just by keeping a little bit of power during the flare it suddenly becomes much easier to make the softest landings ever. I actually find those to be easier to do than regular landings. Thanks to the extra power during the flare everything happens more slowly, so I get a little extra time to make it just right. Do you like the model you have? I'm on a Mac, so I am considering the Columbus V-900 (http://www.buygpsnow.com/Columbus_V900_Bluetooth_GPS_Data_Logger.aspx). I have enjoyed the model I have. I use it with a PC but Peter who recommended it to me uses it with a mac and had no difficulties. I look forward to seeing your flight tracks! I've been using an AMOD 3080 ever since I started flying lessons two years ago. Based on its performance throughout my training and now on my regular flights I highly recommend it. The tracks can be imported through gpsvisualizer.com to convert into Google Earth format with any options and settings you desire. If you look around, you can find one for about $50-60. That is known that cash makes us free. But what to do if somebody has no money? The one way only is to get the personal loans and student loan.